In this entry, I’ll describe the process our museum follows for deaccessioning objects from our permanent collection. Every museum will have a slightly different way of doing this, so this is based on my personal experiences. Before you implement your own deaccessioning policy and procedures, you should check with your governing body and be sure to understand the specific legal and ethical requirements for your own situation. There are many publications on this topic to help you craft a policy and set of procedures. As with all policies, you’ll need to have your governing body approve it before it’s fully implemented. Most museums are established to care for their objects “in perpetuity” – i.e., “forever.” But forever is a very long time in our modern world. Deaccessioning is the process of formally removing an object from a museum’s permanent collection, which is usually that collection which receives the highest level of care in the institution (as compared to hands-on or educational collections, or exhibit props, which might be considered “disposable” and not require the same diligence when the museum decides the objects have lost their relevance or usefulness in relation to the mission of the museum, or have deteriorated beyond a useful level). It’s an integral part of responsible collections management, as long as it is carried out in an appropriate manner and with thoughtful consideration. 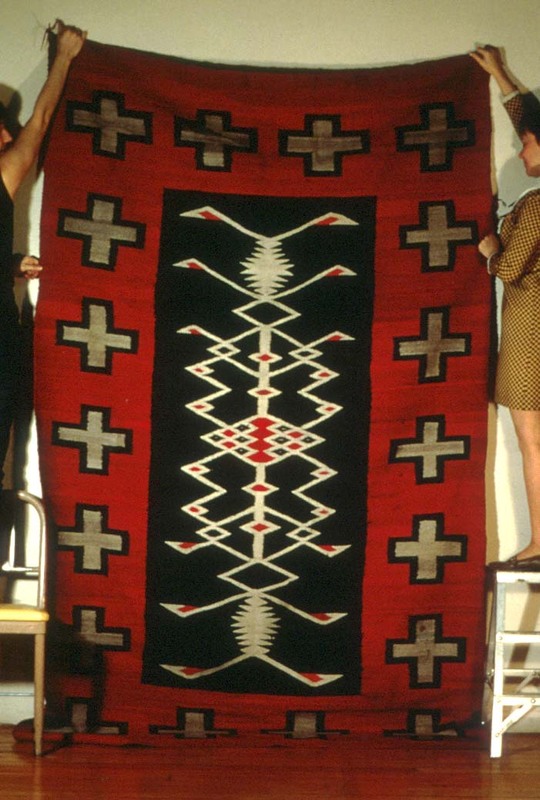 Navajo rug (catalog number 0392-0024) donated to the museum in 1947 to be used as office decorations. Instead, they were accessioned into the collection. Copyright UAMN. In a collection as old as ours (established in 1926), the mission and collecting vision have fluctuated and the artifacts donated have followed these fluctuations. In Ethnology & History alone, Navajo rugs (see right) have been housed in the same room with Eastern Woodland beadwork and pre-Columbian ceramics. Approximately 15 years ago, our department drafted our first collections plan by stating that our collecting vision is to represent as fully as possible, the material culture of Alaska and the Circumpolar North. Anything outside of this geographic boundary should be considered for deaccessioning – our collections range simply does not have space to continue to care for objects that do not support our mission. 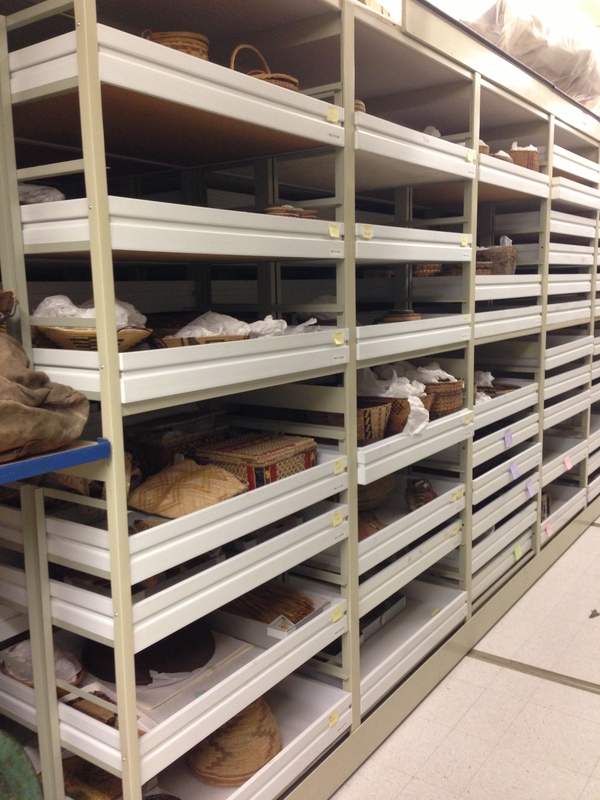 Drawers of non-Alaskan baskets selected for deaccessioning. With this in mind, over 10 years ago I started to identify items in our collection that should be considered for deaccessioning. Finally this summer, with the excellent paperwork-generating skills of Kirsten Olson, the baskets that were separated from our Alaskan holdings by former student assistant, Micole Van Walbeek, are finally going to be moved out of our facility and on to an institution or private individual who will value them for what they are, rather than what they’re not. This round of deaccessioning includes objects that are clearly outside our collecting mission. This is one of the criteria that are listed in our Deaccessioning Policy. Other criteria include: (1) having a lack of documentation that critically reduces the scientific or cultural value or significance of the artifact; (2) deteriorating beyond a point of usefulness; (3) represents an unacceptable hazard to other collections or museum staff. According to our Collections Management Policy, of which our deaccessioning policy is a part, in order to be approved for deaccessioning, the item must qualify under at least one criteria. Many times, items like the baskets in this round, fall under several criteria (lack of documentation and serious condition problems are those that come up most frequently). Once an item that fits at least one of these criteria has been identified, the collections staff should undertake some research. We need to verify all legal and ethical considerations: (1) The museum has free & clear title to the piece and (2) there are no restrictions on the piece (e.g., copyright, MOA/MOU, trust agreements, donor-imposed restrictions, etc.). Some museums, as a courtesy, make a reasonable effort to contact the donor’s heirs. Particularly if the piece is outside the collecting mission and has been in the collection for many years, the family may wish to have the piece returned to them. According to IRS Form 8283, objects must be held in a museum collection at least 3 years prior to removal, or we would need to file a Form 8282 (Donee Information Return). With the paperwork is complete, our Acquisitions Committee (a group of museum staff and community members) will review the documentation and vote on the proposed action. These discussions become part of the permanent record of the items. When the final decision is made, the paperwork is signed and a disposal method is determined. The catalog numbers are either removed from the object or crossed out and paper and electronic files are updated. NOTE: Don’t delete the catalog entry for the object and do not throw away the paper file! Even though the object will no longer be part of your collection, you need to be able to reference the fact that it did spend some of its life there. Change the location field to “Deaccessioned” and make notes wherever relevant to describe the item’s fate. 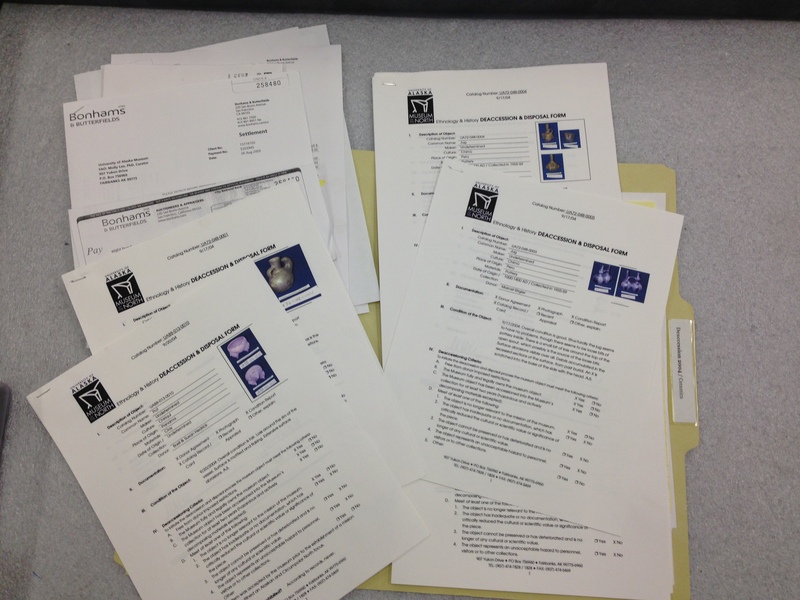 Paperwork from a 2008 deaccession of non-Alaskan pottery. Bonham’s and Butterfields sold the pieces, which generated a total of approximately $2000 in acquisitions funds for our department. Disposal techniques can include: exchange or donation, transfer, sale, or destruction. The technique selected should be based on how best to support the mission of the Museum. Typically, the most controversial technique is sale. Items considered for sale are typically forwarded to a reputable professional auction house where the pieces would be available to the widest audience. This keeps the work out of the hands of the Museum, which helps ensure transparency and a level of separation. No one associated with the Museum should ever benefit personally from a sale of our collections and the funds generated through this sale will go back into a collections fund, for acquisitions or direct care of the collection. After all that work, what have we gained? Valuable space, and possibly funding, for objects that support the mission of our museum.